quotes | Why a librarian? 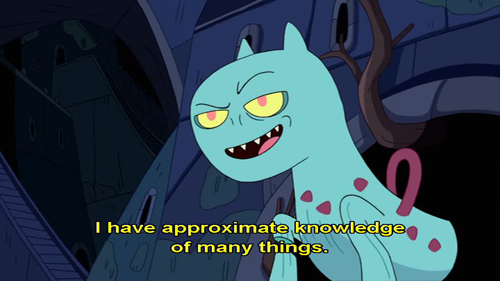 This quote (from Adventure Time, Season 1 Episode 18, “Dungeon”) has become my new motto. You hear people say “Ask the librarian, they know everything” but the fact is that we just know enough to find you what you need. We know how to ask the right questions to help you find the best resource for your project or the new favorite book. It is more our confidence that we can find you what you need than our actual knowledge.